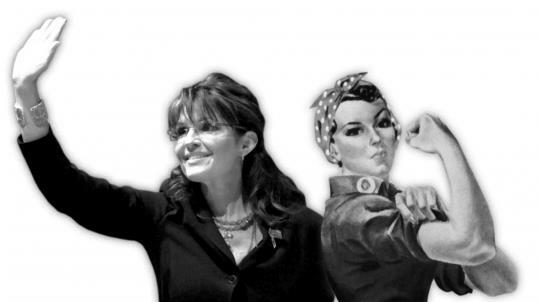 THE LATEST Sarah Palin controversy has to do with feminism. In a recent article in the Washington Post, feminist author and blogger Jessica Valenti blasted the former vice presidential candidate for “adopting the feminist label.’’ Valenti believes that any talk of a conservative version of feminism is a cynical right-wing ploy to fool women into supporting reactionary antiwoman policies. But while Palin may be far from the best spokeswoman for conservative feminism, the idea itself is essential to feminism’s health. But is a feminist like Palin, who has pursued an ambitious career and raised a family, really a feminist? In her autobiography, “Going Rogue,’’ Palin writes, “I didn’t subscribe to all the radical mantras of that early feminist era, but reasoned arguments for equal opportunity definitely resonated with me.’’ She voices a sentiment most American women would embrace. Valenti accuses Palin of pretending to support feminism while disparaging the actual women’s movement and its pioneers; but, ironically, one of the pioneers she names is Betty Friedan, who was herself virtually excommunicated from the movement in the 1970s after criticizing its antimale, antifamily excesses. Who owns feminism today? Many feminists are incensed when the label is appropriated by women who question the Violence Against Women Act, or who argue that the pay differential between women and men is due largely to women’s more family-focused personal choices, not discrimination. Yet critiques of the conventional feminist paradigms of such problems as domestic violence and the gender gap in pay have been made both by many dissident feminists and by many scholars and researchers. To reject them out of hand as incompatible with feminism is not only ideologically intolerant, it also suggests an unwillingness to even consider factual claims that are at odds with dogma. Above all, Valenti is incensed that women who don’t believe women are oppressed dare call themselves feminists. Feminism, she says, is “a structural analysis of a world that oppresses women, an ideology based on the notion that patriarchy exists and that it needs to end’’ — presumably in America and not, say, Afghanistan. But this definition dismisses out of hand the can-do feminism that celebrates female strength and achievement and appeals to vast numbers of women. It also suggests that feminism has an interest in portraying women as oppressed to perpetuate itself. Palin may not be a particularly good spokeswoman for conservative feminism. Earlier this year, when giving a talk on politics and women’s issues at a conservative Christian college, I found that most women were disappointed in Palin, seeing her as ill-informed and lacking in ideas (as opposed to incendiary sound bites). But let’s not fool ourselves: feminists like Valenti would not be any more tolerant toward a conservative woman of Margaret Thatcher-level qualifications. Yet the audience for a different kind of feminism — one that seeks individualistic and market-oriented solutions, rather than big-government-driven ones, and focuses on women’s empowerment rather than oppression — is clearly there. The women who embrace it are likely to transform both feminism and conservatism. The feminist movement ignores them at its peril. Cathy Young is a columnist for RealClearPolitics.com.